The Archaeological Complex “Kaleto” in the northwestern Bulgarian town of Mezdra, which consists of the partially restored and conserved ruins of a prehistoric, ancient, and medieval fortress, has hosted a Medieval Crafts and Culture Festival dedicated to the life in the medieval Bulgarian Empire. The Medieval Festival at the Kaleto Fortress was opened by Mezdra Mayor Nikolinka Katovska, and has lasted for two days. Its opening coincided with the European Night of Museums on May 16, 2015, reports the website of Mezdra Municipality. The participants in the Medieval Festival in Mezdra have presented crafts, traditions, and costumes from the period of the First Bulgarian Empire (632/680-1018 AD) and the Second Bulgarian Empire (1185-1396 AD). 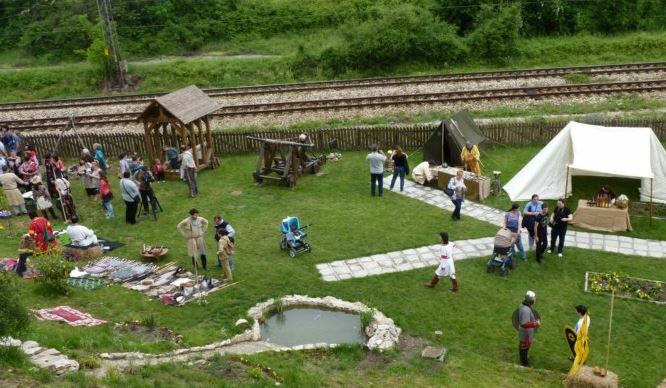 The Varna-based Association for Restoration and Preservation of Bulgarian Traditions “Avitohol”, which is chaired by Zhasmin Parvanov, has presented an early medieval Ancient Bulgar camp in which some of the Bulgar crafts were demonstrated, including knitting of chain armors, forging of war helmets and shields, and leather working. 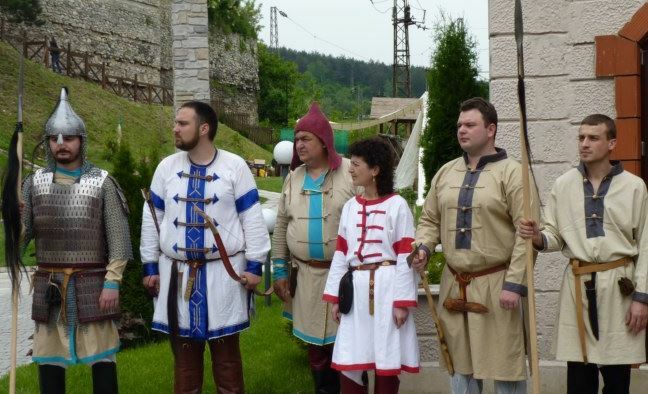 A group of participants led by Yordan Sivkov and his daughter Zhana Sivkova from the northeastern Bulgarian city of Dobrich have presented a military campaign camp and the military traditions, wear, and food of the Ancient Bulgars. Life in the Late Middle Ages was reenacted by Kalina Atanasova and Aleksander Minchev from the Black Sea city of Varna who presented their project entitled “Bulgarian Medieval Costume, 13th-14th century AD” featuring clothing and arms from the period of the Second Bulgarian Empire. 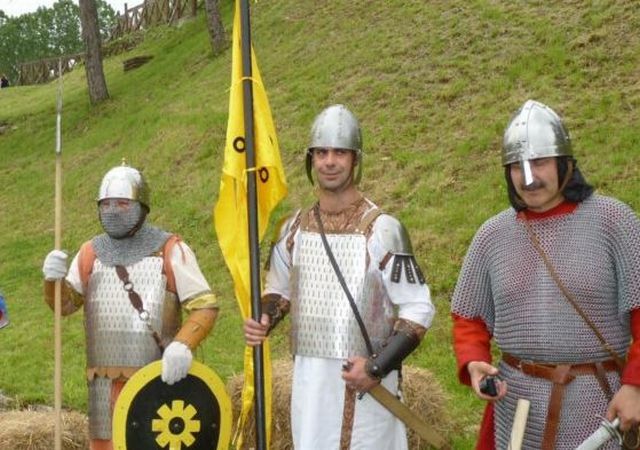 A group of participants from the northeastern Bulgarian city of Shumen led by Toshko Dragnev have presented a Byzantine military camp from the same period. Petar Petrov from Varna has demonstrated the minting of medieval coins giving visitors of the Medieval Festival themselves the opportunity to mint coins with the faces of medieval rulers. Ivaylo Enev from the Danube city of Ruse has demonstrated the forging of war helmets from the Early Middle Ages. Lyubomir Milanov from Sofia has shown how mead was made in Bulgaria during the Middle Ages. 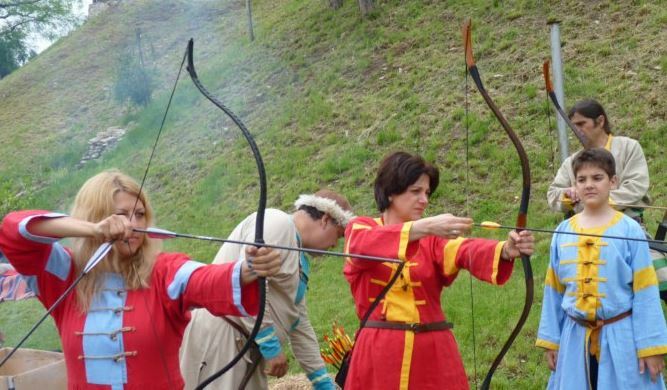 The visitors of the Medieval Festival in the Kaleto Fortress in Bulgaria’s Mezdra also had the opportunity to try archery with a traditional bow, and to see life-size medieval war machines. “We have the ambition to make this Festival an annual event,” Dimitar Pavlov, Manager of the Archaeological Complex “Kaleto” in Bulgaria’s Mezdra, has revealed. The Kaleto Fortress is located in the southwestern corner of today’s Bulgarian town of Mezdra on a rocky hill on the left bank of the Iskar River. The earliest traces of civilized human life found there date back to the Chalcolithic (Aeneolithic, Copper Age), to the end of the 5th and the first half of the 4th millennium BC. The remains of two fortified settlements from this period have been discovered on the hill, both of which were destroyed by forest fires. The Chalcolithic finds reveal that the settlement was inhabited by agriculturalists and craftsmen who specialized in the production and decoration of ceramics and jewelry. In 2008, Bulgarian archaeologists found there a sanctuary of the pagan deity Taurus modeled after the now extinct cattle species aurochs. The prehistoric people believed that the Taurus supported the world on its horns. The finds there included two aurochs skulls and a stone sculpture of an aurochs head. This made the sanctuary unique in Europe. Only two similar Taurus deity sanctuaries have been found – one in Egypt and another one in Asia Minor. On the same spot where the Taurus sanctuary is located the Bulgarian archaeologists have discovered a 2,500-year-old sanctuary of the Ancient Thracian tribe Triballi who were an autonomous Thracian tribe in today’s Northwest Bulgaria sometimes allied with the Odrysian Kingdom, the most powerful state of the Ancient Thracians, and lived independently until the 1st century AD when they were conquered by the Roman Empire (all of Ancient Thrace south of the Danube was conquered by the Romans in 46 AD). During the Roman and Late Antiquity period, the Kaleto Fortress near Bulgaria’s Mezdra was the site of a Roman fortification built in the middle of the 2nd century AD, a pagan cult center from the 3rd century AD, and a Late Roman and Early Byzantine fortified settlement during the 4th-6th century AD. The pagan cult center was also built on top of the prehistoric Taurus sanctuary and the sanctuary of the Ancient Thracian tribe Triballi, and the archaeological layers are distinctly visible even today. From this period, the Bulgarian archaeologists have discovered a lot of bronze coins of Roman Emperors Dometian (r. 81-96 AD), Claudius II Gothicus (r. 268-270 AD), and Marcus Aurelius Probus (r. 276-282 AD) as well as bronze fibulas, belt decorations, a silver leaf from a laurel wreath, and a bronze statuette of an eagle found under the fortress wall. The eagle statuette is one of the earliest known depictions of its kind; it symbolized the supreme Roman god Jupiter (equivalent to Zeus in the Ancient Greek mythology) and was the emblem of the Roman Empire standing for power and might. Another impressive Roman artifact found in Mezdra’s Kaleto Fortress is a bronze key discovered amidst the ruins of a large public building. The Late Antiquity and Early Byzantine fortification in Mezdra existed until the end of the 6th or the beginning of the 7th century when it was destroyed in a barbarian invasion of Avars and Slavs ushering into the fortress’s medieval period. The latest Antiquity coins found in Mezdra are from the reign of Byzantine Emperor Justine II (r. 565-578 AD). During the Migration Period of the Early Middle Ages, the fortress was destroyed and rebuilt several times after barbarian invasions. The last “barbarian” people to arrive were the Slavs followed by the Ancient Bulgars at the end of the 7th century AD who set up an Ancient Bulgar fortress on top of the ancient ruins. The Bulgar fortress thrived during the period of the First Bulgarian Empire (632/680-1018 AD) and was known as Torbaritsa. The Torbaritsa Fotress was destroyed at the beginning of the 11th century by the Byzantines under Emperor Basil II the Bulgar-Slayer (r. 976-1025 AD) who eventually conquered all of the First Bulgarian Empire. 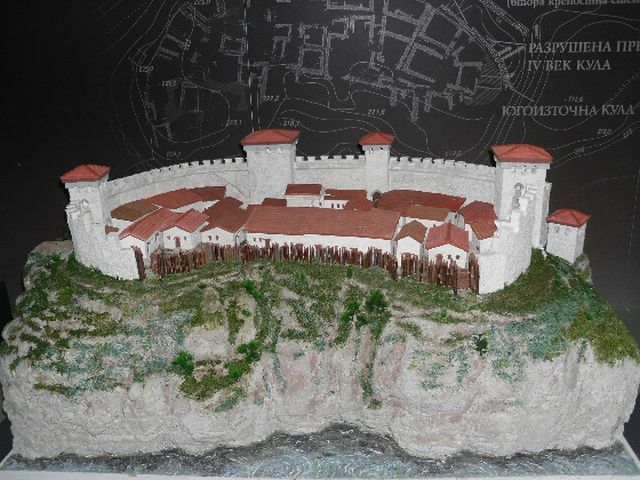 The fortress was also used during the Second Bulgarian Empire (1185-1396 AD) but was demolished by the invading Ottoman Turks after their conquest of Bulgaria at the end of the 14th century. The Archaeological Complex “Kaleto” in Bulgaria’s Mezdra was opened in 2013 after the partial restoration and conservation of the prehistoric, ancient, and medieval fortification and settlement under a BGN 3.9 million (app. EUR 2 million) project of which BGN 3.1 million (EUR 1.6 million) was EU funding under Operational Program “Regional Development”. 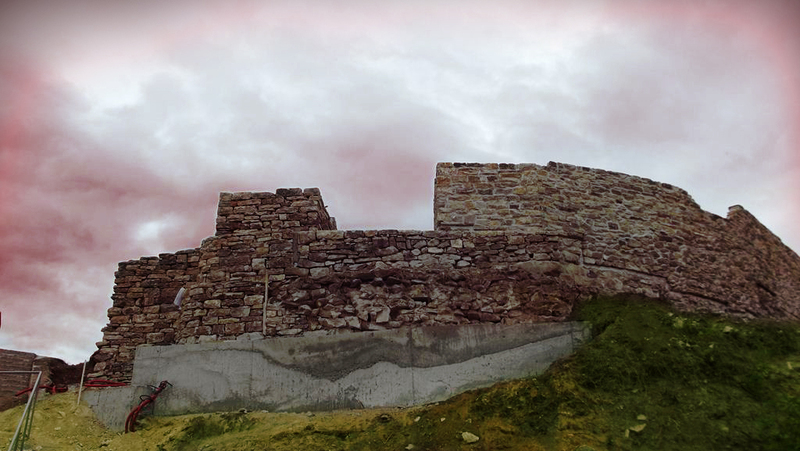 The Kaleto Fortress is often referred to by the locals as “Mezdra’s Stone Treasure”.